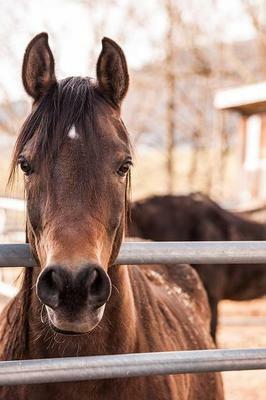 Luna was a frisky Hanoverian mare, with a stubborn personality and a fear of humans. My parents rescued her from a high-end show barn where the horses where treated with no respect. The owner insisted that the equines where to be whipped whenever they did the opposite of what they were forced to do. As that will probably paint a horrible image in your mind, I will move on. Luna came to us, terribly afraid of any human that crossed her path. So, I made it a priority to show Luna that there still is a friendly person in the world. "It's ok, big girl. I won't hurt you," I crooned to the big chestnut mare. She stared back at me with a fearful look and trotted the other direction. She had such a wonderful conformation. Arched neck, she pranced on. "You'll never catch me," she seemed to chant. "OK, time for our first training session." I studied the round pen I stood in. Then I looked at Luna's body language. She didn't look happy. Ears pinned, muscles tensed, Luna stationed herself as far away from me as she could. Then I remembered what I had learned from training my Thoroughbred gelding, Prince. Luna's eyes rolled and she showed off the whites. She was obviously in a distressed state. I tried to ignore her, and push aside the sea of thoughts that crowded my head. I stood at the gate, trying to look harmless. All I wanted was to share the space. I stood there for what seemed like quite some time, and Luna eventually gave a long sigh. I smiled slightly and left the ring. The following month I was beginning to get some progress. We had established personal space, and touch Luna's forehead when she allowed me to. I had clucked my tongue to get her attention, and finally was able to catch her. Luna even backed up on command. Now I had her on a lead rope, and was teaching her to stand still beside me. I held the lead rope in one hand and stood about three feet from her nearside. She attempted to move off, skittering along the grass, but a gentle click of the tongue caught her attention and she stood still at my side. Each training lesson was got easier every time. "I can't believe how far you've come in a little over a month," I whispered to the horse. "You're a miracle." Because she was doing such a wonderful job in everything I had asked her to do, I tried testing to see if she would walk toward me with a little convincing. I held my hand in front of her face, and she laid her ears back ever so slightly. I backed way from her and she almost stayed in place. The only movement she made was an agitated stamp of her foreleg. She seemed to understand my compliment, because she perked her delicate ears forward at the sound of my voice. I clucked my tongue and she took cautious steps toward me. Inside, I was whooping with joy. I decided to give her a well deserved rest, but couldn't wait to continue the next day. After many months more of training and bonding, Luna was ready to be mounted. I was over the top excited and had a hard time controlling my emotions. During the past few months I had gotten her used to the saddle and bridle again, but now was the pay-off. I lead her over to the small mounting block my father had placed on the side of the round pen, and asked her to stop with the wave of my hand. I ever so slowly placed the reins over her head and strolled to her nearside where the mounting block was located. I was scared but confident, and my confidence seemed to take over. I swung aboard with such swiftness, my mother gave me a thumbs-up from outside the pen. Luna tensed for only a minute, then swiveled her ears around to take in the sounds around her. I nudged her sides, and off we went. Just like a push-button pony, she seemed to jump into a swaying walk. A smile stretched across my face and I could see tears in my mother's eyes. When Luna came, she was an uncontrollable horse, like a mustang who had been chased by a pack of wolves. But now she was a good-natured Hanoverian show horse, obeying the lightest touch from my boot heel. It was pure miracle. Tears filled my blue eyes as I watched a blue ribbon wave in the gentle breeze. The ribbon hung from Luna's polished leather bridle. She was a champion, and a fighter. She pushed through her fear of human beings with a little help from I, Amanda B. She truly was a miracle horse. Is it a true story or fiction? Either way, it's very well written and inspiring!